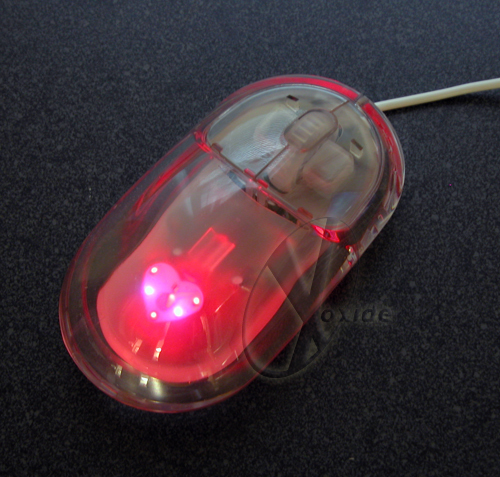 Tell your mom, girlfriend, internet stalkie, or hoochie mama you heart her face and her computer with The Super Flashy LED Heart You Optical Mouse! This 100% Optical Mouse has no balls whatsoever! The Super Flashy LED Heart You Optical Mouse projects a LED sensor beam through it's acrylic housing to sense movement without any moving parts! That is great news for those of us that are tired of the poor performance of worn and dirty balls. A 3rd button scroll wheel sandwiched between twin primary mouse buttons brings Super Flashy LED Heart You Optical Mouse productivity to new heights. But that’s not all, as its name suggests, The Super Flashy LED Heart You Optical Mouse actually has a Super Flashy LED Heart buried deep within the hollows of its clear acrylic chassis! This Super Flashy LED Heart is the perfect display of just how much you heart that special computer in your life! Oh the humanity!